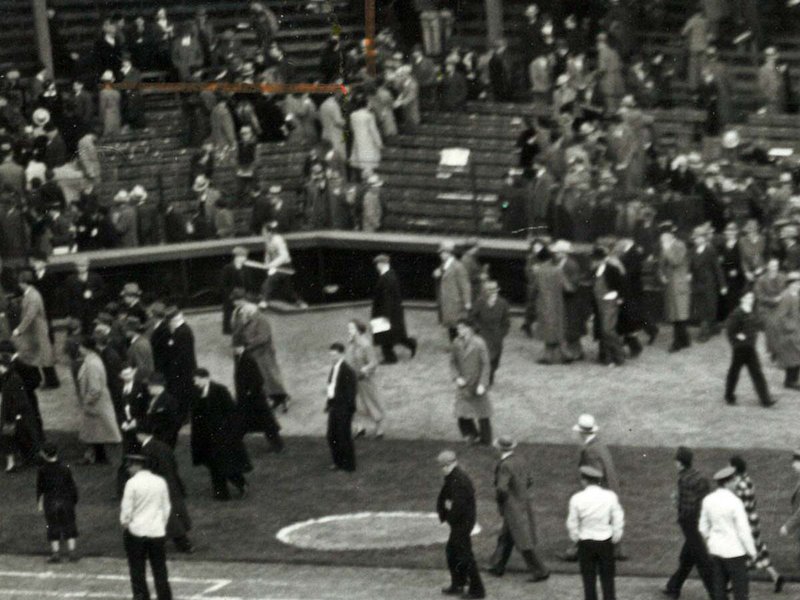 From the 1938 home opener, we get this amazing photo from the Milwaukee Journal of fans leaving the ballpark by... walking on the field? The first rows of summer leaving the ball park. 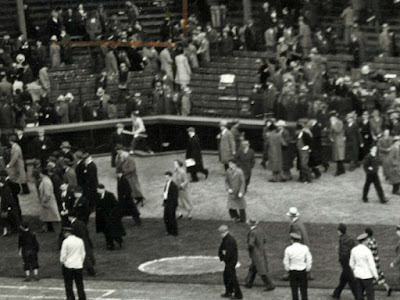 Fans were asked to respect the infield grass as they started for their streetcars on 8th st., but not all of them remembered. The grass looked more than fit to stand up under a few score grounders and a few thousand exits. Unfortunately, the focal point is the foreground. But we can still get a great deal of information about Borchert Field from the entire photo. 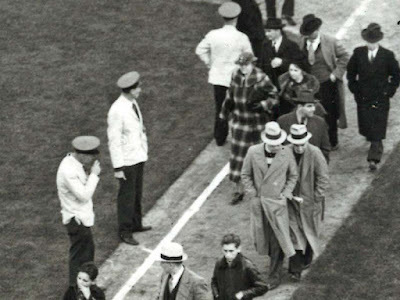 I love the uniforms worn by the ushers, as they stand trying (in vain) to keep the fans off the infield. White jackets with dark ties and trousers. Can't tell what color their peaked caps are - blue, perhaps? The white jackets certainly make them stand out in this photo, as they would have stood out at the ballpark. The entire Borchert Field staff was given new uniforms for 1938 by team owner Henry "Heinie" Bendiger, who had purchased the Brewers from the Phil Ball estate in early 1934. 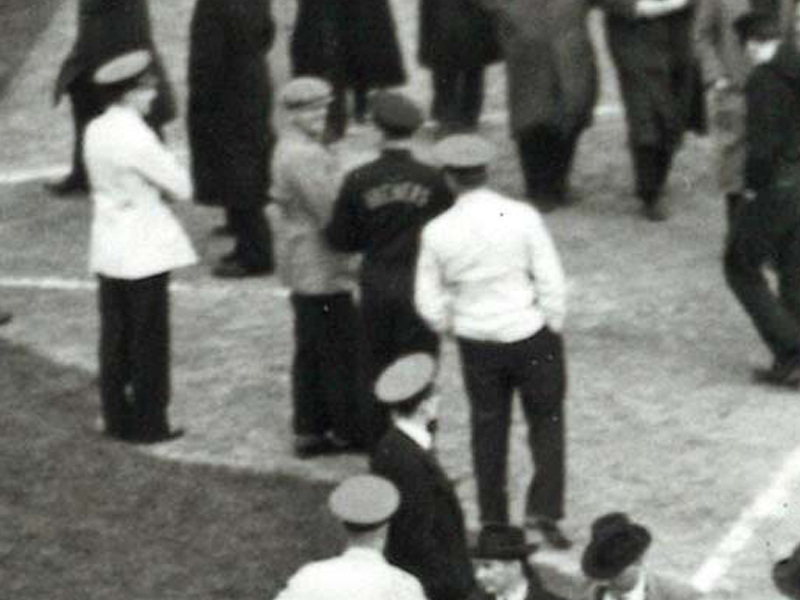 Speaking of uniforms, this gentleman at home field is wearing what appears to be a dark jacket with the name "BREWERS" in arched letters across the back. I'd love to know more about this. Team jacket? Or maybe coveralls? Perhaps that's the groundskeeper, watching the fans trample his grass underfoot. The photo also shows us the rudimentary safety precautions at the Orchard. Today, our ballparks have netting wrapped around the diamond from base to base, and behind home plate all the way up to the second level. 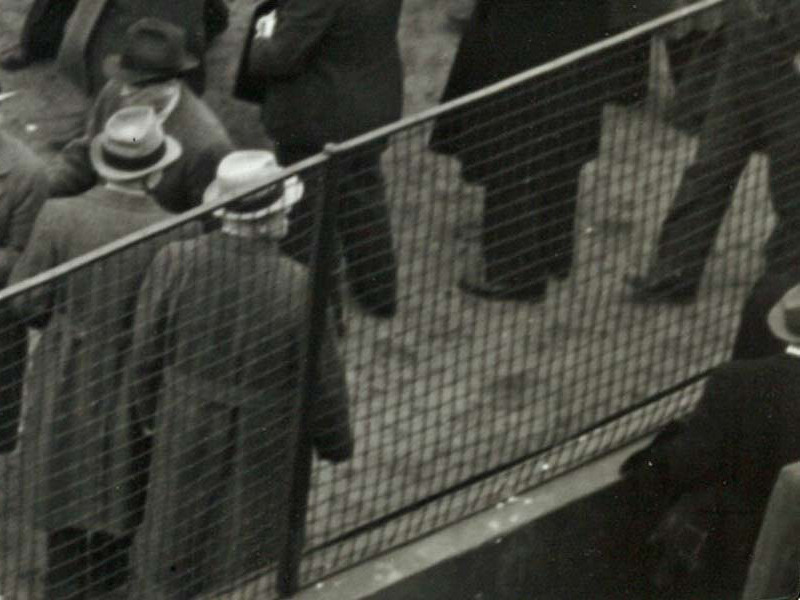 In 1938, however, only a few feet of fencing stood between Bendiger's patrons and the field. 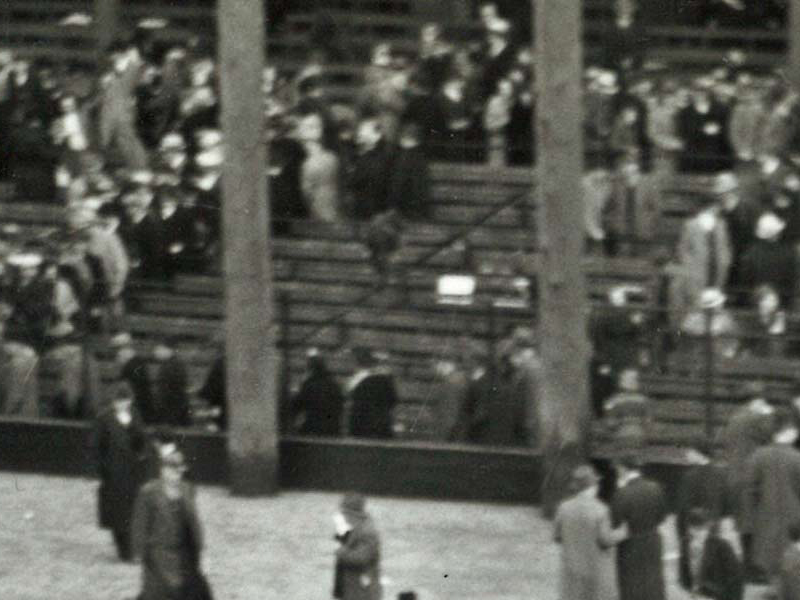 Speaking of ballpark infrastructure, we can see once again how obtrusive the light poles must have been. They were added in 1935, almost fifty years after the ballpark opened, and for want of a better place were installed on the field directly in front of the stands. And finally, we get another look at Borchert Field's distinctive angled dugouts. 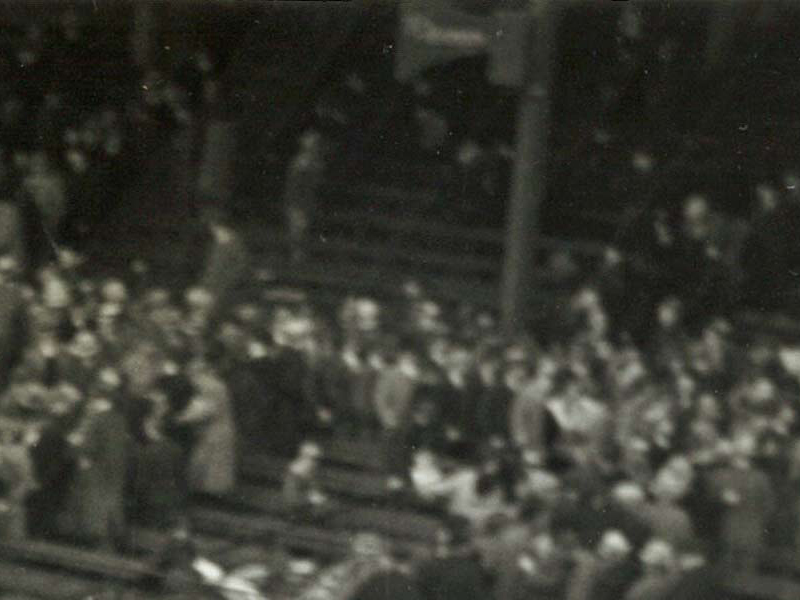 The Brewers won that day, beating the Columbus Red Birds 9-2. Aside from being Opening Day, it was also manager Al Sothoron's birthday, and starting pitcher Whitlow Wyatt gave him one heck of a present; a wonderful four-hit complete game. Those two Columbus runs came in the eighth, when the Brewers were already up 6-0. 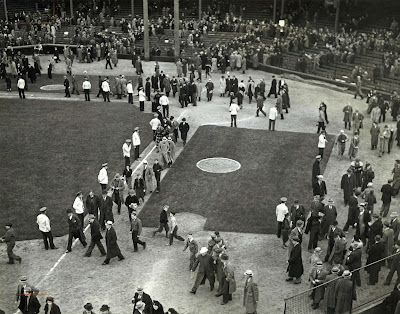 It must have been a heady experience for the Milwaukee faithful; the first win in the books, walking over the Borchert Field grass on the way to the exit.